Colombia’s foreign Minister Carlos Holmes announced Friday that his country is withdrawing from Unasur, the union of South American countries after months of division between member states. 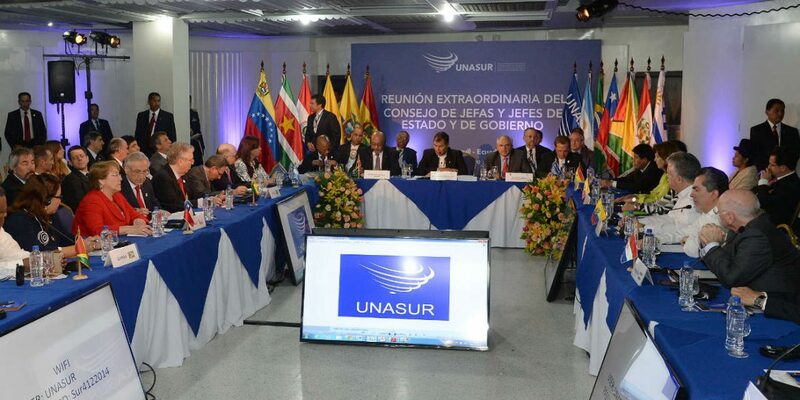 The country suspended its membership in April after months of infighting on the worsening situation in neighboring Venezuela and the succession of Colombian ex-President Ernesto Samper as the South American union’s president. The bloc was founded in 2008 to promote regional integration and diminish US influence in South America. Political divisions, however, had virtually paralyzed the organization. Other countries led by conservative governments also suspended their membership, mainly over disagreement on Venezuela, a founding state that has slowly degenerated in a virtual one-party state similar to Cuba. Holmes said that other countries who suspended their membership in April could follow suit and withdraw, which would effectively end the continental project that essentially sought regional integration. Since its foundation, the governments of a number of member states have shifted to the right while the socialist-run Venezuela has become increasingly authoritarian. Resolutions that sought to condemn human rights violations in the oil-rich country were sunk by Venezuela’s allies in the region and countries that depend on free oil distributed by Caracas. The organization has been without a secretary general since January last year when former Colombian President Ernesto Samper ended his term. The lack of consensus and leadership has removed “the conditions that allow taking decisions” as one body, former Foreign Minister Maria Angela Holguin said in April.